Provides a toolbar dropdown to attach to any predefined process. Development of this extension is not a priority for me as I think ReAttach extension is just as good or better at the same thing. I recommend trying ReAttach. Adds a toolbar with "Attach To" dropdown that can be used to quickly attach to any often debugged process (IIS, NUnit, custom). 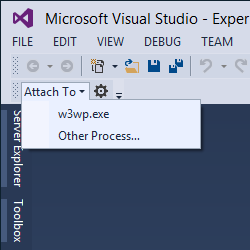 The list of processes can be configured through options. You can find the source code at https://github.com/ashmind/AttachToAnything. Also there is another extension released literally in the same day (a bit later), which may be better. I recommend checking it out: ReAttach by Erland Ranvinge.